This chart updated by Mara French on 9/8/13. Numbers in brackets [ ] show sources and refer to the bibliography at the end of this chart. An asterisk (*) shows continuation of that line. Send any corrections or additions to this chart to marafrench@mindspring.com. Revisions: 2009, 2011, 2013. 4.1 Mary French, b. 12 Sep 1763 in French Cove in Bay Roberts, Newfoundland, Canada, to Edward and Elizabeth French . She is listed in the microfilm copy of the Edward French Shipping Co. log . 4.2* Edward French, b. 11 Aug 1766 in French Cove, in Bay Roberts, Newfoundland, Canada, to Edward French, made his will in 1829. He m. Mary, b. in 1767 and d. in 1855 . Edward is listed in the microfilm copy of the Edward French Shipping Co. log . Ref. lists Edward as owning land in 1775, 1796, 1797, and 1802 in Bay Cove. He lived next to Robert Merser, Jonathan Merser, and Abram Earle, all surnames who married into the French family. Edward is listed in the 1817 Newfoundland Census, Bareneed, living with 1 woman and 3 children. See Number of Inhabitants in Bare Need on 27 Sep 1817. Mary, his wife, is mentioned in the Will of Anne Batten, 1836, concerning her umbrella and one suit of clothes to be chosen by herself. Edward French Sr., Thomas French. monies which may be in England at the time of my death. "the balance which may be due to me on the voyage of the present season"
"my brother, Abraham FRENCH of Bay Roberts, and Richard RYAN of Bearneed. 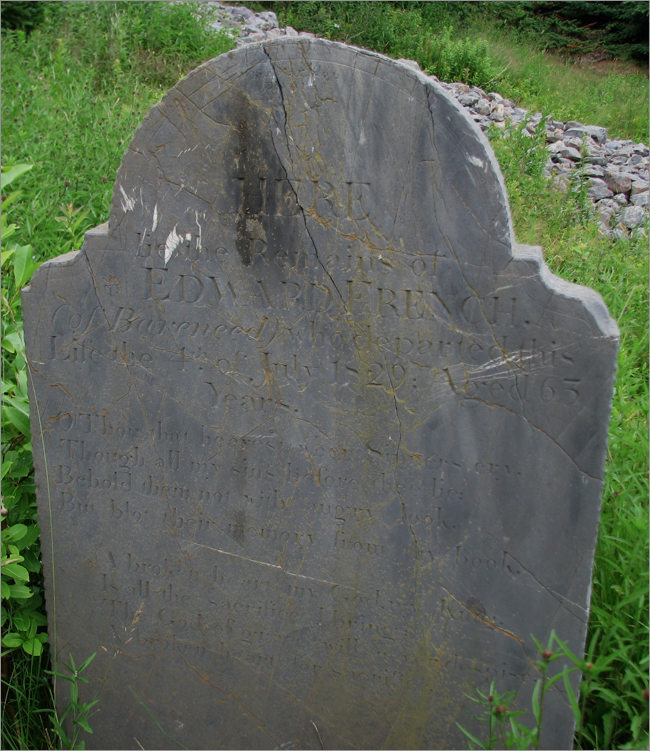 Mary French, probate 1855, widow of Edward French, Bareneed Port de Grave. Will of Edward French from Newfoundland will books volume 1 pages 77 & 78 probate year 1829. In the name of God Amen. By this my last will and testament, I Edward French, at the Dock, Bearneed, being of sound mind and memory do will and bequeath as follows. First, I commit my soul and body to the Mercy of God, praying that he may give me a joyful resurrection and a place in his heavenly kingdom. 2d I bequeath to each of my children, the sum of One hundred pounds sterling (except my eldest and youngest sons, John and Edward French,) i.e. to Elizabeth Hussey, Joseph French, Ann Dawe, of Ship Cove, Abraham French and Mary Batten. 3d I bequeath to my wife, Mary, and to my son, Edward jointly all the monies which may be in England at the time of my death, together with the house, outbuildings and land, occupied and owned by me at the Dock, Bearneed at the time of my death. 4. I give to my sons Joseph and Abraham, the house, ground and all thereunto pertaining belonging formerly to James Butler, and given to me by a decree of the court at Harbor Grace. 5. I give to my wife Mary, and my son, Edward Jointly, the balance which may be due to me on the voyage of the present season after paying all wages and other lawful expenses. 6. I give to my four sons, John, Joseph, Abraham and Edward, the Schooner "Brothers" with all her materials, together with all the nets, seines, and every article used in the fishery, skiffs, boats, barking kettles, &c.
7. I give to my wife and my son Edward all my cattle & sheep to dispose of as they please. 8. I also give to my wife and my son Edward all monies which may remain after the payment of the aforesaid legacies, wheresoever such money may be placed. They will see however that I am respectably buried, and pay out of said money my funeral expenses. 9. I hereby appoint my brother Abraham French of Bay Roberts, and Richard Ryan of Bearneed, my Executors to see this my will carried into effect. 10. I hereby also direct that when my sons, Joseph and Abraham shall require shingles, board & nails my son Edward shall supply them with a sufficiency for the erection of a convenient house each. Joseph and Abraham however are to assist in sawing such board as may require sawing. Given under my hand and seal at Bearneed this third day of July in the year of our Lord one thousand eight hundred and twenty-nine. Edward his x mark French (LS) Witnesses Charles Blackman. Ann Beecham. Grace Boone. His wife, Mary, wrote her will on 17 Jun 1852 and died in 1855. From this will we determined her grandchildren. 1 silver tea spoon for Abm's daughter Mary, 1 do. do. for Ed's Mary, 1 do. do. Grace. Photo taken in 1996 and contributed by William Mugford, wfm4819@yahoo.ca. A broken heart my God my Kind???? 4.3* William French, b. 14 Aug 1768 to Edward and Elizabeth French, date listed on his father�s Shipping Co. log . He owned land in 1797 . William is listed in the 1817 Newfoundland Census, Bareneed, living with 1 woman and 4 children. See Number of Inhabitants in Bare Need on 27 Sep 1817. 4.4 Gordon French, b. 29 Jul 1770 to Edward and Elizabeth French, date listed on his father�s Shipping Co. log . 4.5 Samuel French, b. 1 May 1772 to Edward and Elizabeth French, date listed on his father�s Shipping Co. log . He d. 29 Nov 1781, going on 10 years, at Bay Roberts . 4.6 John French, b. 11 Jul 1774 to Edward and Elizabeth French, date listed on his father�s Shipping Co. log . 4.7 Abraham French, b. 16 Feb 1778 to Edward and Elizabeth French of Bay Roberts, date listed on his father�s Shipping Co. log, mentioned in his brother Edward�s will of 1829. Abram is listed in Ref. as owning land in 1804 next to Jonathan Snow and William Badcock in Bay Roberts. He m. Frances Mercer of Bay Roberts on 27 Dec 1805 . 4.8 Joan French, b. ca. 1780 to Edward and Elizabeth French, illegible date listed on her father�s Shipping Co. log . 4.9* Nathaniel French, b. ca. 1782 in Bay Roberts, Newfoundland, to Edward and Elizabeth French, illegible date listed on his father�s Shipping Co. log . He married Charlotte Ann Bradbury, also of Bay Roberts, on 6 Jan 1806 . He wrote his will on 12 Dec 1851. Will of Nathaniel French, Registry of Deeds & Companies Confederation Building, St. John's, Vol. 14, pg. 45-46. In the Name of God, Amen. I Nathaniel French of Bay Roberts, Conception Bay in the Island of Newfoundland, Planter, being of sound and disposing mind [and] memory & understanding but considering the uncertainly of life do this Twelfth day of December in the year of our Lord one thousand eight hundred and fifty one make this my last Will and Testament in manner following that is to say: I give and bequest to my Son Abraham French that piece or parcel of land situate in Bay Roberts aforesaid on which his house now stands together with the Kitchen Garden before his House as it is now fenced in, also that piece or parcel of land behind his House extending back to the Stable House [say?] 15 feet. To my Son Charles French I give and bequeath one half of the remainder of my land situate at Bay Roberts as aforesaid the cleared and unleased land to be equally divided. I also give and bequeath to him one half of my loose property such as Cattle, Sheep & Pigs. To my Wife Charlotte French I give and bequeath the remaining half of my land together with the Dwelling House thereon to be held by her as long as she remains unmarried but at her decease or on her marriage I will that all this portion of the land together with the Dwelling House thereon erected become the property of my Sons Edward and Isaac French share and share alike. I further give and bequeath to these my sons Edward & Isaac French the remaining half of my loose property such as Cattle, Sheep & Pigs share and share alike. I further will and [illegible] that in case of my Wife Charlotte French's marriage or decease my son Charles French do take possession of this portion of my land and property to hold in Trust for the interest and benefit of my Sons Edward and Isaac French until they are both of age. To my Son Nathaniel French in consequence of his undutiful conduct I give and bequeath but one Shilling, and I nominate and appoint the Reverend Martin Blackmore, Miss'y, and Mr. Charles Mercer, Planter, both of Bay Roberts, my Executors to this my last Will and Testament and I hereby revoke all former and other Wills by me made and do declare this to be my last Will and Testament. In Witness whereof I the said Nathaniel French have hereunto set my hand and seal at Bay Roberts aforesaid the day and year first above written. A.B. The land I have given and bequeathed is bounded on the East by William Badcock's property and on the West by Mrs. French and proberty North by Abraham and Samuel Mercer's and South by the Sea. I have given it also to these my Sons, their heirs and assigns forever. I hereby Certify that the execution of the will of which the foregoing is a true and correct Copy by Nathaniel French the Testator was proved before myself on the Twenty second day of October one thousand eight hundred and fifty three by the Affidavit endorsed thereon of Charles Calpin one of the subscribing Witnesses thereto and the same is in due course hereby actually Registered by me this day. Given under my hand this Twenty fifth day of October one thousand eight hundred and fifty three A.D. 1853. 4.10 Rebekah French, christened 28 Nov 1781 (born as early at 1778). 4.11 Mary French, christened 28 Apr 1783 (born as early 1780). She may have married William Caravan in Jan 1806 and had several children – this marriage information is put here as a placeholder for future research and could have been an entirely different Mary. 4.12* John French, christened 18 Sep 1785 (born as early as 1782) in Bay Roberts, Newfoundland, Canada, Listed in the St Paul's Anglican Baptism - Harbour Grace (1775 - 1899, Section 3. Found in Newfoundland�s Grand Banks. He d. ca. 1852 in Newfoundland. Baptism Record in the Pre 1891 Registration Records, Vital Statistics, Volume 110, Harbour Grace District, Church of England Births 1785 - 1795 Page 38 found in the Newfoundland Grand Banks. Vital Statistics this to be baptism date. He m. Mary Willicocks in 1806 and had daughter Rebekah. Marriage listed in the St Paul's Anglican Church Marriage Records 1776 - 1899, Harbour Grace, Found in the Newfoundland Grand Banks, Mary's Maiden Name is listed as Wilcocks. 4.13 Sarah French, m. Lockett.